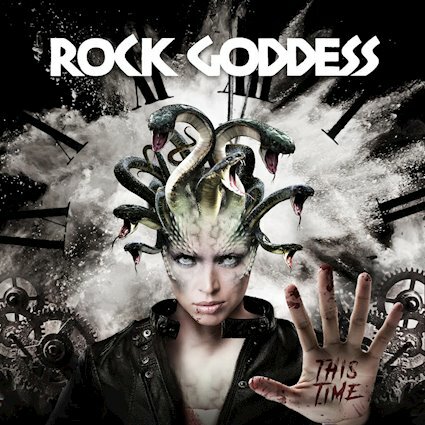 RockUnitedReviews: ROCK GODDESS - "THIS TIME"
ROCK GODDESS - "THIS TIME"
Rock Goddess are a name that will be familiar to anyone who grew up with UK heavy metal in the 1980s, even if you can't hum any of their songs. Me, then. They were a band I was always aware of but never listened to over their 5 or so years of being in the spotlight. Formed by the Turner sisters Jody (vocals/guitars) and Julie (Drums), "This Time" is their first full length release in over 30 years, aided by Jenny Lane on bass, replacing original Tracey Lamb who has had to step down. A cool cover gives the release some class before you listen, and those who expect some tired old NWOBHM music will be in for a shock, as although Rock Goddess are unashamedly retro in their style they are certainly not without charm. Lead single "Are You Ready" kicks off the album, and it's a decent, upbeat track that shows you that Jody Turner can still belt out quality vocals. The music is decidedly old school but it's played very well by the trio and a decent, bass-heavy production really makes a difference. To be honest, there's not a great deal of variety throughout, save for the closing rock ballad "Drive Me Away", which is pretty good an contains a killer solo from Jody that should have been twice as long. Along the way we have some catchy, heavy songs that work very well, like "Call Into Space" and the galloping "Why Do We Never Learn". Yes, it's all quite similar, but it's also good fun and certainly gets the head nodding and the foot tapping. MARILLION: "Happiness is Cologne" "Popular Music"
KANE ROBERTS: The New Normal"
QUIET RIOT: "One Night in Milan"
NEAL MORSE BAND: "The Great Adventure"